Kate Cayley lives in Toronto. Her first collection of poetry, When This World Comes to an End, was recently published by Brick Books. 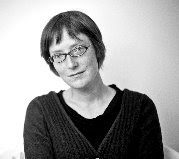 She is a playwright-in-residence at Tarragon Theatre, and her play After Akhmatova was produced at Tarragon in 2011. She has also written a young adult novel, The Hangman in the Mirror (Annick Press). Her poems and short stories have appeared in various places including CV2, Descant, Event, The Fiddlehead, The New Quarterly and The Literary Review of Canada. Her first collection of short stories will be published next fall. My first book was a young adult novel called The Hangman in the Mirror, which was published in 2011. Before that I was a playwright who’d published some stuff in literary magazines. It changed my life in the sense that I had my name on the spine of a book—something I’d wanted for years. Having my first book be a novel, and a novel for younger readers, was not something I’d ever planned, and it happened somewhat by accident—it grew out of a play and used the same source (a woman in 18th century Montreal who’d been sentenced to hang for stealing, and saved her life by persuading the soldier in the next cell, who’d never set eyes on her, to become the hangman and marry her). I’d always imagined that my first book would be poetry. So it felt different as an interesting and enjoyable side-step. But I suppose it’s all riddled with the same preoccupations—history, the unbelievable accidents of history, storytelling as a kind of life-saving measure, the storyteller with their back to the wall. I found it easier to conceive of poetry. Poetry could happen in this state of excitement and clarity—fiction is a much longer road, and while of course there’s craft in poetry, I find the craft more subjective. As for non-fiction, I would love to write essays if I had any idea how, but it never even occurred to me as an ambition originally—and besides, non-fiction needs a certain level of personal exposure, you don’t have the excuse of a “voice” which is easily understood as not your own. I was always interested in poetry that took on a character separate from the character of the author—which of course isn’t really possible, but you can pretend it is. I usually begin a project with a different project which turns out to be the wrong one. On a grand scale, I spent ten years focusing on being a theatre director before it dawned on me with anything like finality that I wanted to be a writer, even though I was writing as much as I could manage. Scares me a bit that I’m that slow on the uptake—what’s going to dawn on me next? Similarly, I get very excited about something and spend a lot of time working on it, before eventually realizing that there’s a kernel of an idea there that is meant to be something else. And then the real project becomes clear. My initial writing comes very quickly. If I can’t finish a first draft of a poem at a sitting, or maybe two, it’s unlikely to get finished at all. But the rewriting is a much longer process. The shape of the first draft—that depends. Some things have only a word here and there altered, others are tinkered with for years until they are something else. Though the more I write, the more likely it is that the first draft will be closer to the last one. This is heartening. A poem begins at random—I have trouble sitting down with the idea of writing poems because it all flies away when you look at it straight on. So I often end up writing poetry when I’m supposed to be working on something else. This collection wasn’t conceived of as a collection. But that might change—I’d love to work on something with an overall theme, poems that had a kind of narrative arc to them the way a novel would, poems that culminated like a story. I don’t have a lot of experience with readings. When I do them, I hate the idea of them and everything about them and dread them for days—and then I have a really good time and wish I could do more, because it’s so lovely to feel that someone is out there listening. Oh boy. Yes. And no. I suppose the concerns of history, of our place in time, not just of our own moment and our own life but in relation to the past, personal and political past, the sense of history as a tragic condition, and the forms of mythology. I would like to pose some questions about time and death and memory, I don’t know about answers. I’m not sure what the current questions are. There are too many and I’m not educated enough or attentive enough at the moment to know what is most pressing and what is just headlines from the culture war. I used to want art to be political in some obvious way. Now I’m afraid it’s not, and this makes me very nervous. But I think the role of the writer is to express, to the best of their ability, the absolute specificity of where they are placed—to be most fully and purely an individual voice. Context makes this a political act or a trivial one—everything ranging from totalitarian states in which the “voice” of the writer is a stance against the monolith, to, more immediately, our own glib relationship to language in a culture in which language is cheap and plentiful. Writing can be a serious encounter with words when we bleed words out of our eyes. We’re drowning in wordiness, so writing is particularly problematic right now—why say more? But on the other hand, maybe good writing can rescue the sacredness of words, just a little bit. I am just starting to gain more experience working closely with editors, as I publish more. And I love it very much. Even when I disagree, it makes me think about why I’m doing a thing. “Do not hurry. Do not rest.” –Goethe. 10 - How easy has it been for you to move between genres (poetry to plays)? What do you see as the appeal? It’s been fairly easy, or at least one protects the other. As in, the poetry has a place to live, so it doesn’t screw up the plays (hopefully) and also the other way round, though I think poetry can accommodate more, is more flexible. Plays are (to me) probably the least flexible form of writing—the rules of classic dramaturgy are really pretty good and to deviate very far from them you have to be wildly and boldly original, which I’m not. I find poems much more forgiving. I write in set hours, very scheduled. I have two young children and my incredibly helpful and supportive partner also works so writing happens in specific times. If anything the pressure of having a family has been very good for me—there’s nothing like a school pickup to get something finished in time. I impose deadlines on myself and I love deadlines, possibly to a fault. I feel like I’ve won if I “finish” something early, even if it isn’t really finished just hurriedly patched up, and besides I’m the only person in the world who cares I’ve finished. On a typical day I sit down in the morning with an idea of what I will work on and hope for the best until around mid-afternoon. I have a certain number of pages or words or a certain amount of revising to do, decided the previous day. On a good day I do it. The internet is the major enemy, and my own anxieties. Post-it notes above the desk are helpful. I walk around. I buy groceries. I give up in disgust. I read—it’s better than giving up in disgust. Ground coffee. Herbs. A slightly musty smell our house has, coming up from the basement. I agree with McFadden. Yes, there are some other inspirations, but if I was honest I’d have to say that for me books only come from books. There’s an element of one-upmanship to writing too—you read something perfect, you want to measure yourself against it, to try it yourself. Alice Munro, W. H. Auden, The T. E. Lawrence Poems by Gwendolyn MacEwen, Possession by A. S. Byatt, Angela Carter, Chekhov, The Broken Estate by James Wood, William Trevor, Jhumpa Lahiri, Yiyun Li, The Waves and Mrs. Dalloway by Virginia Woolf, Joseph Brodsky’s essays, Anna Akhmatova, Robertson Davies’ Deptford Trilogy, The Anatomy of Keys by Steven Price, White Stone by Stephanie Bolster, The Invention of Love by Tom Stoppard, Philip Larkin, Austerlitz by W. G. Sebald, Lion in the Streets by Judith Thompson, White Teeth by Zadie Smith, Anne Sexton, Snapshots of a Daughter-in-Law by Adrienne Rich, very recently the poetry of Wendell Berry, who is a voice crying in the wilderness. Write a novel in fragments that appears to be isolated stories and yet forms a coherent narrative. Write novels generally. I have no idea. Probably a professor of literature. I would have hated it though. I’m not rigorous or systematic enough to be a good academic. Not being good at very much else. I was a decent theatre director but the life is too absorbing and obsessive—aside from wanting to write, I also wanted to have a life that was concerned with more than the black box. 19 – What was the last great book you read? What was the last great film? What We Talk About When We Talk About Anne Frank by Nathan Englander. Lifted the top of my head off—you think you know what he’s doing, and then he changes the rules completely. Amazing. I haven’t stayed awake for a whole good movie in a while. Probably The Lives of Others. A play about art forgery and war crimes. A book of short stories. Some poetry that I hope will be the start of a new collection.